Got my '19 manual SEL yesterday after waiting a while for it! ...and it arrived to the dealership with a water stain on the headliner. To be honest, I was debating just leaving the dealership and calling it but I went and talked to the service manager. He seemed very truthful and frank about it and told me it was a big repair where they had to replace the headliner and do some other stuff to prevent it leaking again but he saw them all the time and they knew how to fix them. So I'll get that sorted out. Other than that, love the car. 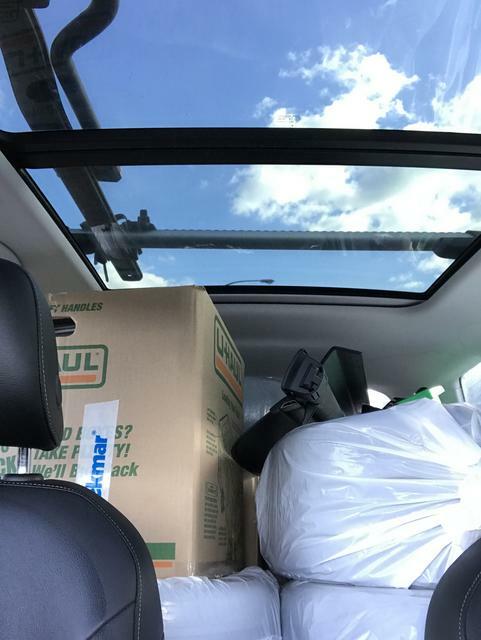 I understand your emotional decision - wanting the car you have waited so long for but - It is a huge job! And there are so many variables about the repair if not done correctly ie. tech who does it etc... Don't know if it is possible but I would demand a different car. I have gone through it. Best of luck either way. I'm debating those rear side wings as well. Can't decide if I'd like them on my Tungsten Silver GSW. Well the rear window spoilers in black fit with the black car IMO. I didn't get 0% and I'm retired so I don't want payments. I kept my Carrera for 20 years took really good care of it and sold it for enough to buy the Golf R, but it didn't really float my boat as much as I thought it would so I sold it and bought the Alltrack. I love the Alltrack. Just hope the leak doesn't rear it's ugly head again. Don't intend to go crazy with mods either. I really like those and keep debating ordering/installing on my GSW. Good work paying it off. Mine bought in Nov '18 will be paid after the man (taxes) gets his - same, crappy local bank financing to get the best OTD price. Huge DP so not much interest for the ~6 payments I will have made vs. bothering with a refi. Nothing better than driving a paid off car! 1) wiper removal was harder than I thought. I bought a cheap hand tool and it was outmatched by how tight they were on. I wonder if the dealer over torqued them when it was in for leak fixing? Basically destroyed the tool getting them off, oh well, $20 tool cheaper than dealer labor! 2) I wasn't sure how the front shielding attached, so I ended up loosing 2 of the 3 clips! First one shot across my garage never to be seen again. Second one I kept a hold of, third one I dropped down the engine where I think it ended up on the under engine shield. There was no way I was going to take that off to save one clip. I'll pick up a few from the dealer soon. I want to have a few extra's around as I'm getting my front glass replaced in a few weeks and I won't be surprised if they loose some too. 3) The drivers side front one was a bit of a pain to pry off, it's wayyyyy back there. 4) I couldn't fish my bicycle cable all the way through the driver's front whereas I could on all the others. Instead I poured some water down the drain and it ran through FAST! 5) Passenger rear is totally obscured by the exhaust shield. Once you move that aside though it's easy to pry off. All 4 of my traps had dirt on them, but less than I expected. 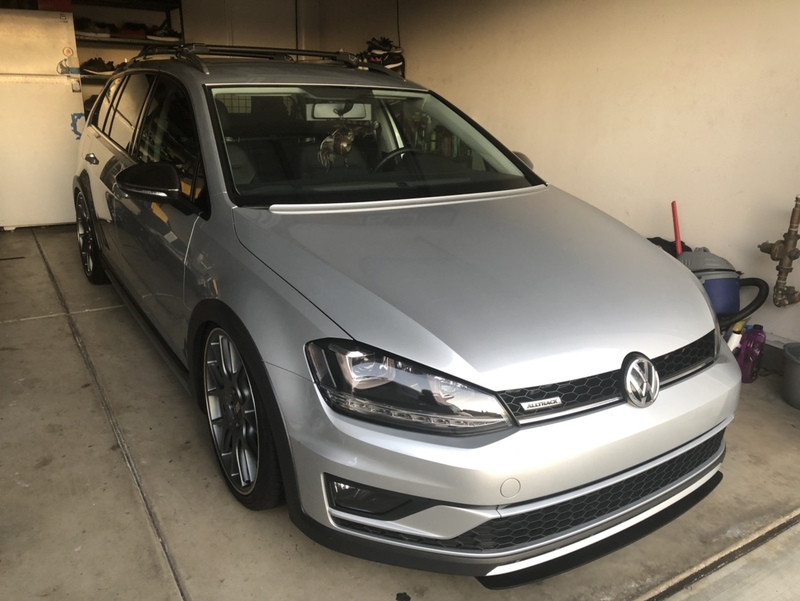 I'm glad I got this done as my Alltrack will be moving back outside soon to make room in the garage for my Porsche. 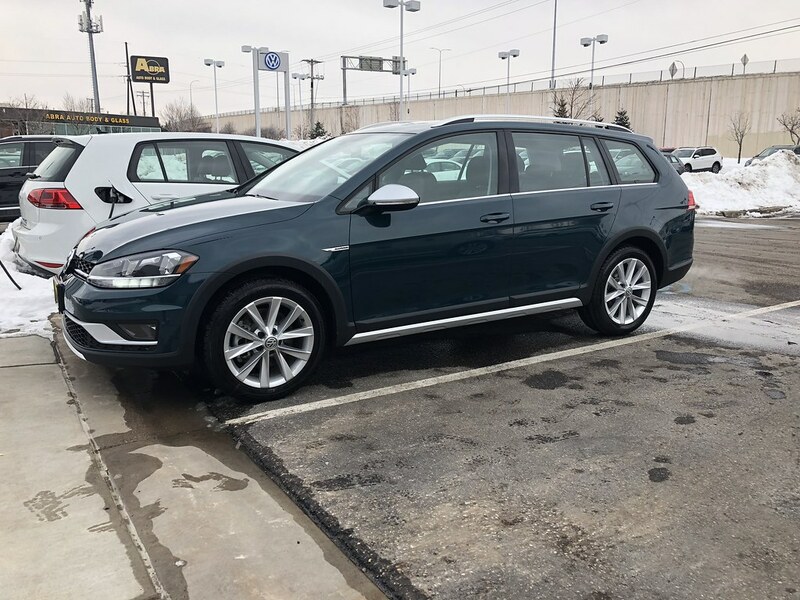 My 2018 Alltrack is finally done... New to forums but not to VW. Had a MK7 GTI and Crashed it. It was a SE 6MT. I literally took everything off before the Insurance took it away for a full loss. I ended up getting a 2018 Alltrack SE. 8) Mille Miglia Rims in 17"
Last edited by IconAlltrack; 03-26-2019 at 01:32 PM. I didn't read IS20, it's not done. IS20 is being inquiried on... waiting on a guy who crashed his GTI and hes giving his turbo away since its totaled. Just pay shipping. BTW - title of the post is "Alltrack is all done...for now"
How do you like the DV+? I put it on my Abarth and found a world of difference. Was considering this for my alltrack as well. I drove my new 19 White AllTrack S with a manual home today! Cant wait to see what I can do to it! I have had the GFB on three cars so far and the turbo flutter is definitely minimized. When you get the APR Stage I - which I had on an AUdi B6 1.8T, a GTI and now the alltrack, I had no flutter on the Audi, A LOT on the GTI and some on the Alltrack. On the GTI it was very noticeable I had flutter on the 1st, 2nd and 3rd. On the Alltrack I would get flutter in 2nd, and 3rd - when I was flooring it. The Alltrack with the APR Stage I gets very little in 3rd gear now and thats when my foot was all the way down trying to push the car. Its functions way better than original in either case. You also get the turbo whoosh with out being completely obnoxious. The flutter is supposedly bad for the turbo system so if you are getting any flutter after an ECU upgrade, I definitely recommend the GFB DV+. Nice work. I found my wiper arms were on really tight from the factory, not just the dealer. 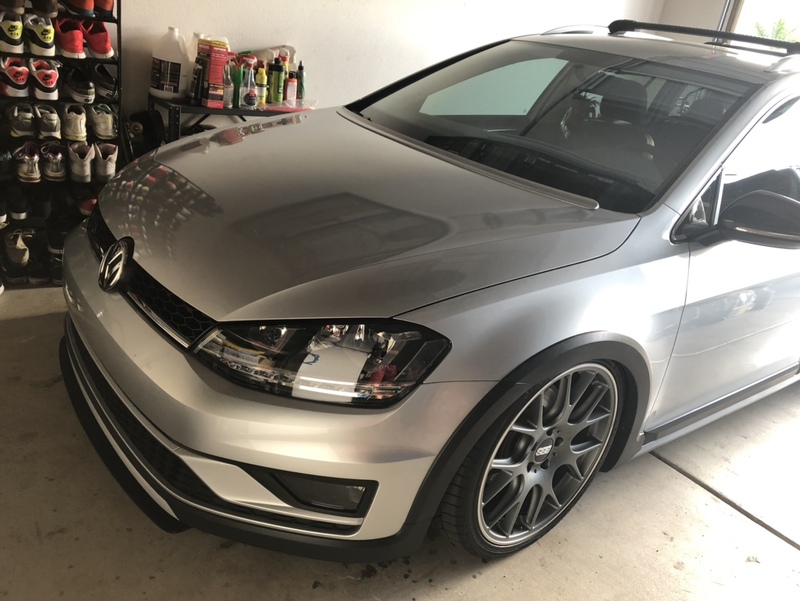 [QUOTE=dholter09;113176129]Finally installed golf r springs & rear tt pads. Love how it sits now, just need to get an alignment. Also installed ECS Tuning spacers. 12.5mm front and 20mm rear. I didnt go with the flush kit because I have heard that rubs with the stock 17" wheels. Westside! That's where I bought my '18 SE 6mt! I put an AEM open intake on the alltrack, and was kinda disappointed by the sound, or lack there of. So i'd consider anything that would give me a bit more engine acoustics. I have the JB4 and AWE track exhaust. Will probably go APR 1 at some point. Did you notice any change in throttle response? yes! I've been to Burnsville VW for service and had good luck with them as well. What are those added buttons around the hand brake for? Took the winter tires off and put on the new 3 seasons on. Correct. The one under the Handbrake is for the Sierra LED Light bar, its a three position rocker light and this is the only place I could fit it. The blue is for the front pods that I mounted to the front of Thule Cargo XT rack, the red is for the rear LED pods on the rear of the rack that face backwards. Definitely a change in throttle response. 2nd gear is the game changer on the APR 1. From what I observed is that theres an additional 6lbs of boost. Before the mod at least on EVO guage it was maxing out at 16psi boost, with the APR I am getting around 22-23. I noticed I was pushing the car yesterday and it started fluttering in 5th gear. If you dont have the dogbone insert or the APR dogbone mount you will not feel the engine as much because it allows for movement of the engine. I do have an spare Spulen street dogbone insert that I ended up not using, if anyone wants it I have all the parts, the bolt, the washer and the insert. Ill let it go for $20 if anyones interested - Just PM me. Its never been used - I tried to install it but versus the APR mount that the dogbone insert is a little tougher to install, especially if you dont have a car lift. You can use a jack to push it in, I just didnt have a spare jack lying around that could reach it. Not today but the other day. More like a mk1 duckbill. Right. Only it goes straight out. Question for anyone who has played around with aftermarket wheels on the Alltrack. I'm already thinking these will fit, but wanted to verify first. Looking at a set of 17x7.5 ET35 wheels for our Alltrack. I believe these will sit 13mm closer to the fender by themselves. Then I'm looking at wrapping them in 225/50/17 tires. The wheel calculator I used said they will end up being 17mm closer to the fender in the end. Seeing as the ECS flush kit for the Alltrack 17" wheels is a 20mm spacer front, 25mm spacer back, I think these will fit pretty nicely without rubbing. And I'm on stock suspension. I assume these will work fine? Anyone running a similar size/offset? i will chime in on ESC spacer kit, the rears will rub with stock 205-55-17 tires but only when heavily loaded (+600lbs) in the back, it's the sidewall that rubbed against the plastic cladding. Take that for what it's worth if you're going wider.